Arena.Xlsm is a fully-fledged RPG with over 2,000 enemies, 1,000 items, boss encounters and four different endings. We've all heard the jokes about how some RPGs require you to spend hours poring through spreadsheets to be successful. But what if the spreadsheet was the RPG? 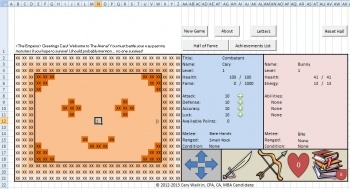 Cary Walkin, an accountant and MBA candidate at the Schulich School of Business in Toronto, has come to the salvation of bored office workers all around the world by coding a fully-fledged RPG entirely in Microsoft Excel. The game has over 2,000 enemies, 1,000 items, boss encounters, and a full story with four different endings. Arena.Xlsm is an arena-based roguelike RPG. Grinding, a chore common to most RPGs, doesn't play too big of a role in Arena.Xlsm, with the game's creator telling us that "The leveling system acts primarily as a gatekeeper to gradually introduce new story, enemy types, spells, etc. The amount of kills needed per level should be approximately 3-6 kills regardless of level. Level grind can ruin the pacing of a game so I've done my best to keep it to a minimum." As well as the procedurally generated enemies and items, the game features 15 unique items with special effects and eight unique boss monsters. There are also 31 different spells for you to learn, and 36 achievements to earn. More information on the enemies, items and spells can be found on the official Arena.Xlsm wiki. Arena.Xlsm has been tested to work on PC versions of Microsoft Excel including Excel 2007, and Excel 2010. It should also work on Excel 2013 although this has not been extensively tested. Arena.Xlsm will not work on Mac versions of Microsoft Excel. The game uses Excel macros to execute the programming for the game. In order to play the game you must enable macros in Excel. Saving your progress is as simple as making a copy of the Arena.Xlsm workbook and renaming it. The game is available completely free from Walkin's wordpress, so go ahead and ruin your productivity for the rest of the day.